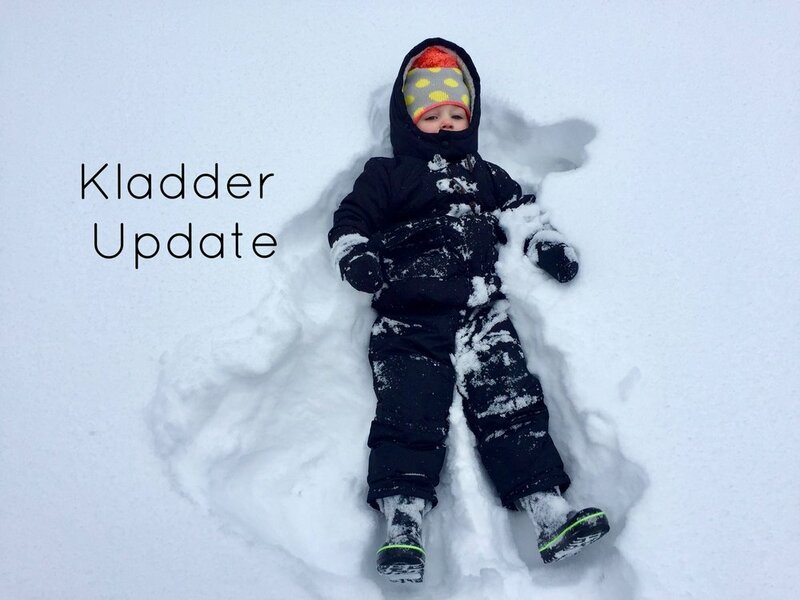 Kladder Update: Tis the Season! Santa! You know him? We saw him last weekend at Fredrick Meijer Gardens for one of their member holiday events. Natalie asked for an amulet necklace (Sofia the First fans anyone?). Santa likely thought she was asking for an ambulance. Don't worry Santa, I've got you #AmazonPrime. We're big fans of the Railway Garden display and if you haven't gone, be sure to visit before it's gone on January 7th. Last weekend we also partied on Rosewood for the 3rd annual Progressive Dinner Party with neighbors. Four stops, one hour each, complete with food, drink and merriment. This year we hosted stop #4 (desserts!) and I took my new punch bowl (a steal of a deal at a local antique shop for $12!) for it's maiden voyage. We served a holiday inspired cocktail that included champagne, vodka and cranberry. Jeff was pleased, the gents ended up playing darts in the newly half-finished basement late into the evening. Earlier this month I joined some girlfriends for the Uptown Shop Hop followed by dinner at Terra where I had the most fabulous martini of house-made infused earl-grey gin. Shop Hop this year seemed a bit out of sorts compared to years past: the busses were running extremely slow allowing us to only visit 2 of the 4 participating neighborhoods. We were able to stop by Lee & Birch where I snagged a new gold necklace and some cute pink slippers as well as Rebel in Eastown where I found an ornament for a gift exchange I'm in. We're highly considering forgoing the bus hop on/off experience next year and just driving. Two weekends ago Jeff and I joined friends Kevin and Ashley for all kinds of holiday cheer at Broadway Bar on the Westside. It's a must see location during the month of December because they 'deck the halls' in every extreme sense of the phrase! We had a fabulous night out but the real noteworthy story here is how inspired I am to facilitate a holiday bar hop for December of 2018. This is not a joke. I'm all jacked up for Christmas... a year from now. Last week I took the night off as mom and wife to enjoy Bad Moms Christmas the movie with girlfriends at Celebration Cinema North which now has a bar?! Get this, you can order drinks at the bar and take them INTO the theater with you! The movie was absolutely terrible in terms of storyline and cinematic quality... but I laughed the entire time! We also enjoyed our nieces Christmas Program this month at Ivanrest Church in Grandville - Jeff's brother is on pastoral staff there. 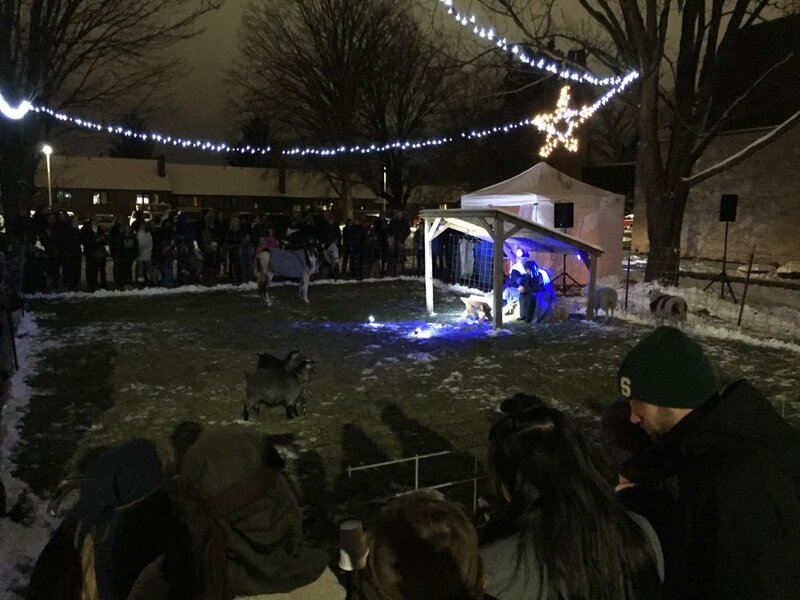 The girls were adorable and following the program Ivanrest put on a live nativity outside complete with angels on the roof (which seemed questionable at best), real animals and a donkey that allowed rides for the kids. Also worth mentioning, the donuts... there were hot, freshly iced donuts and hot cocoa - my kind of churching! We'll finish this week out with a few more holiday parties and last minute prep before the big family celebrations. Wishing you and your family the best over the next few weeks of December. Merry Christmas! Peace & Toil - Like unique house plants? Check out this new start up in Grand Rapids. 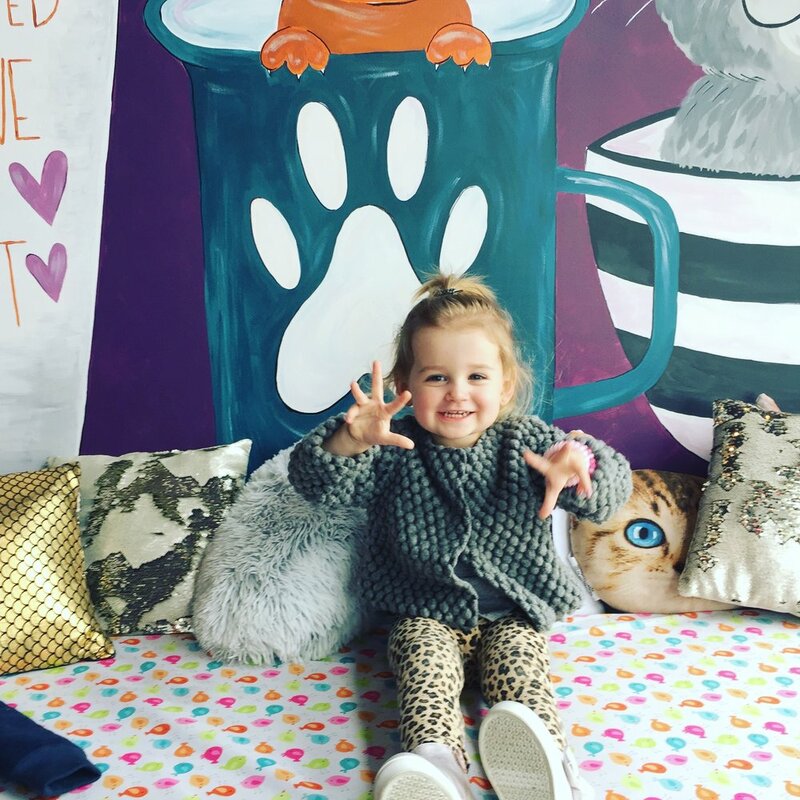 Happy Cat Cafe - Like cats and coffee, this place is for you. Review coming soon! Rise Grand Rapids - I'm not even vegan, but these treats are amazing! The Peas & Carrots appetizer from NOCO Provisions. This Bourbon Advent Calendar that was a gift from our friends who know us all too well!